Tabernacle of the Invisible Girl. 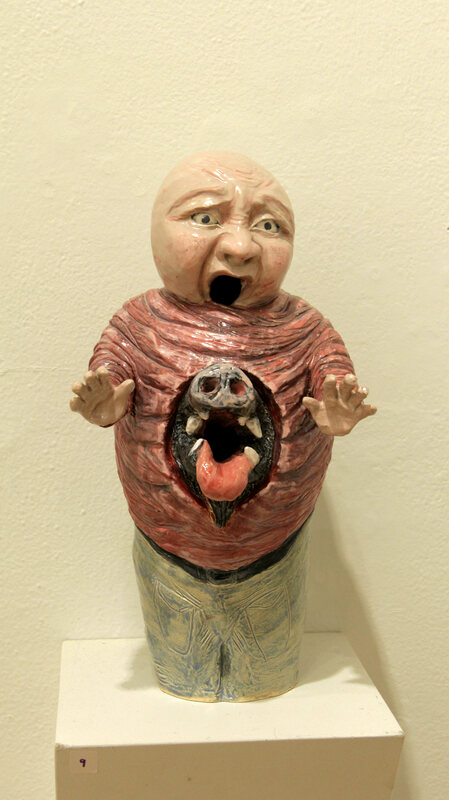 Clay, glaze, 16 in. h. x 9.5 in. w. x 6.5 in. d. I made this tabernacle in the form of a moonshine jug, with the traditional white and brown glaze- (there is a handle in the back.) Written in cursive on the front is "Drink me." The cork for the jug becomes the head for the surrounding figure. This outer shell is what the"invisible girl" shows to the world. This public figure's arms are outstretched, her very body a vessel to be imbibed. She invites us to drink her in. 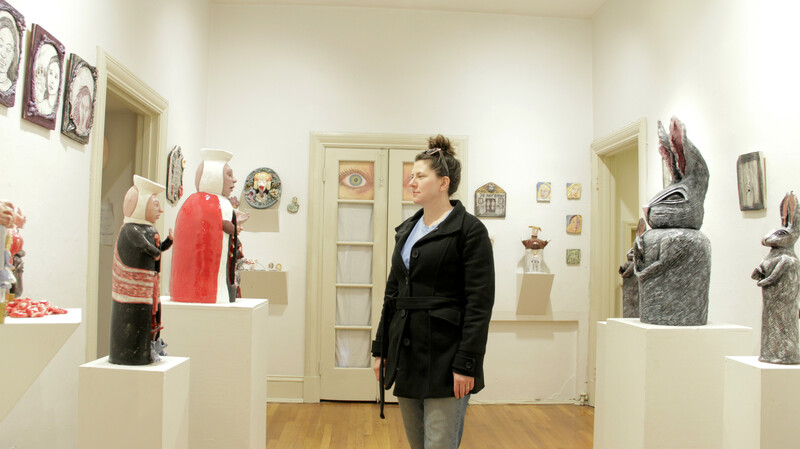 Solo Exhibition: "Have you been to the Wonderland Family Church?" 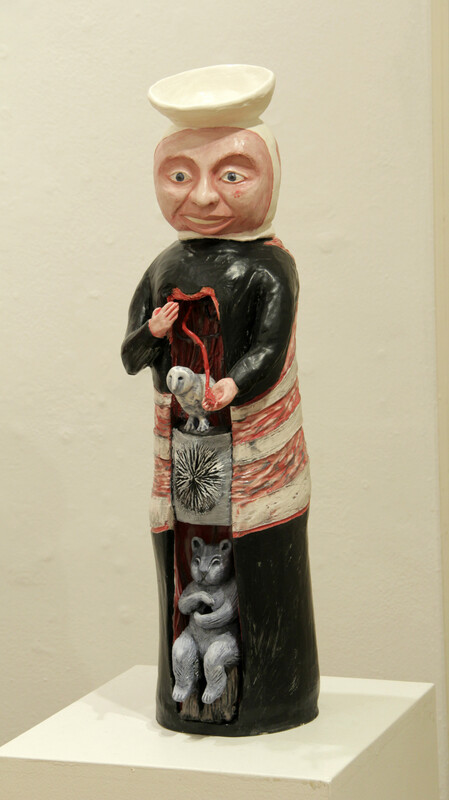 I use the forms and titles of traditional religious objects in my sculptures as a foundation for my work. I've taken the idea of the tabernacle, as an object to house the sacred body and blood of Christ, and inserted my own content. In this way I am challenging the idea of who “belongs” there. 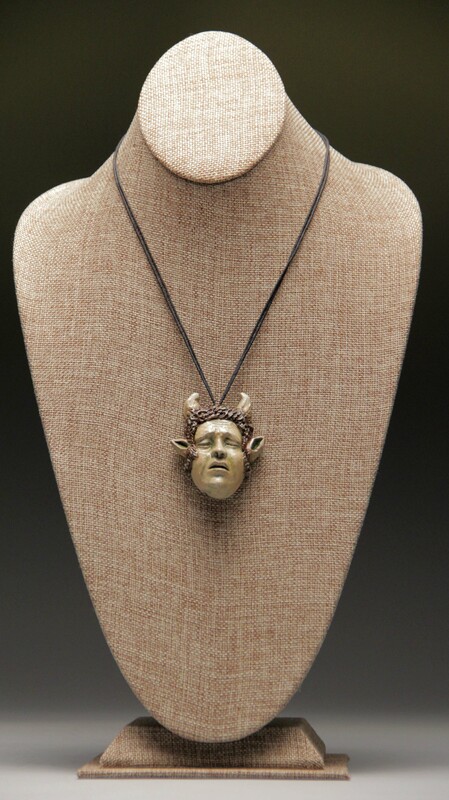 Much of the visual style of my work comes from my study of ancient ritual objects. I feel related to these artists of the past. I have been inspired particularly by Mayan ceramic vessels, Canaanite burial pods, Egyptian canopic jars, and Sumerian votive figures. My favorite works express a deep connection to our shared humanity and to the natural world. They transcend the culture in which they were created and connect us to each other on an emotional level. In addition to drawing upon religious objects in my work, I have also been exploring more modern mythologies and popular stories. 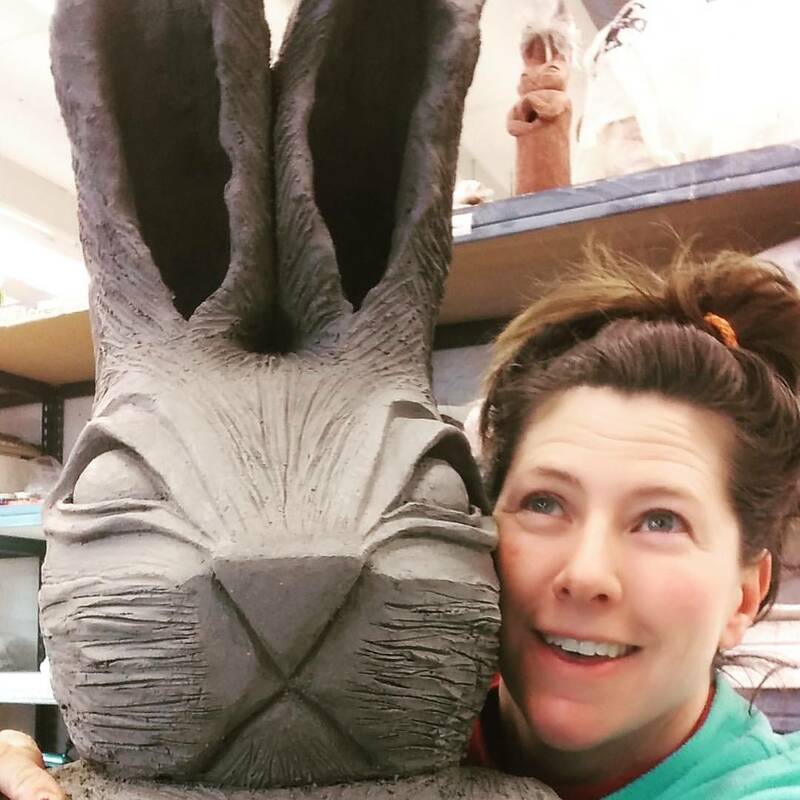 Recently, I have been integrating characters and colors from the story of Alice in Wonderland into my sculptures. 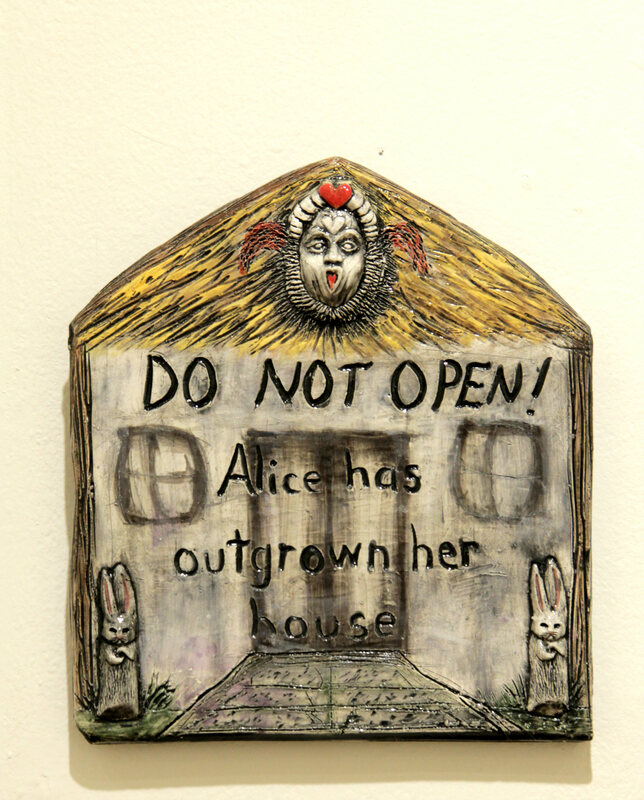 I can relate to Alice, who has fallen into a world that does not make sense, and yet still struggles to find meaning. 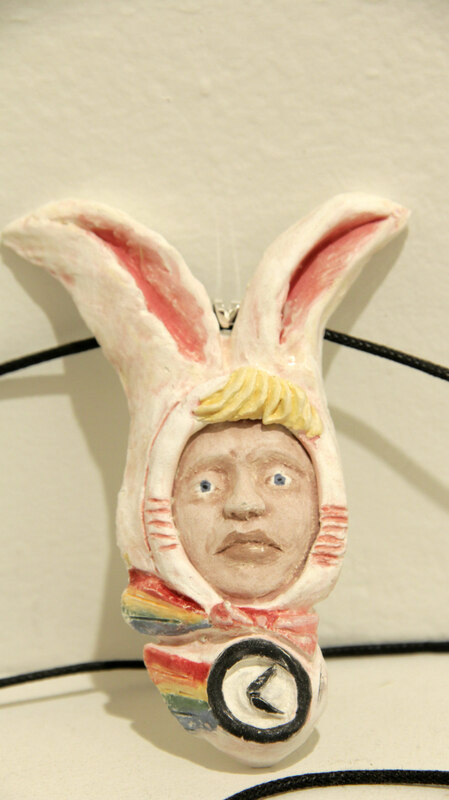 The white rabbit is also a sympathetic character- the “everyman,” who seems to embody the stresses of modern life as he serves his queen, attends obligatory social events, and multi-tasks his way into a perpetually harried existence. My work has been a way for me to process the alienation of my past, and to challenge the beliefs that create boundaries between ourselves and the natural world. 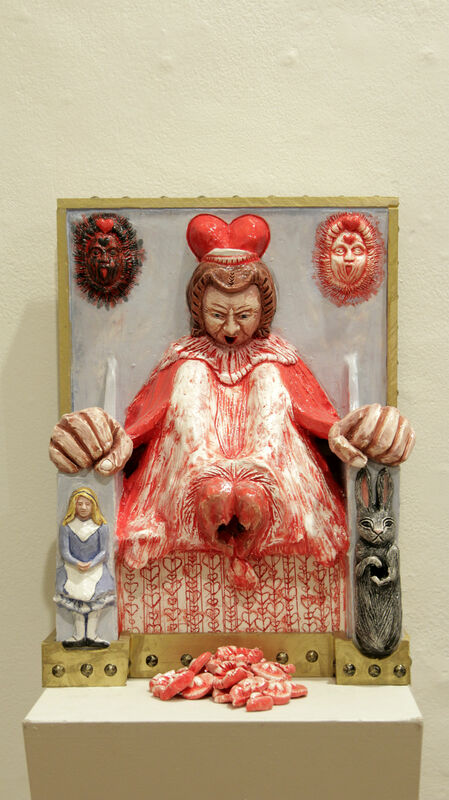 "Beware the love of the Red Queen" clay, underglaze, glaze, wood, paint. 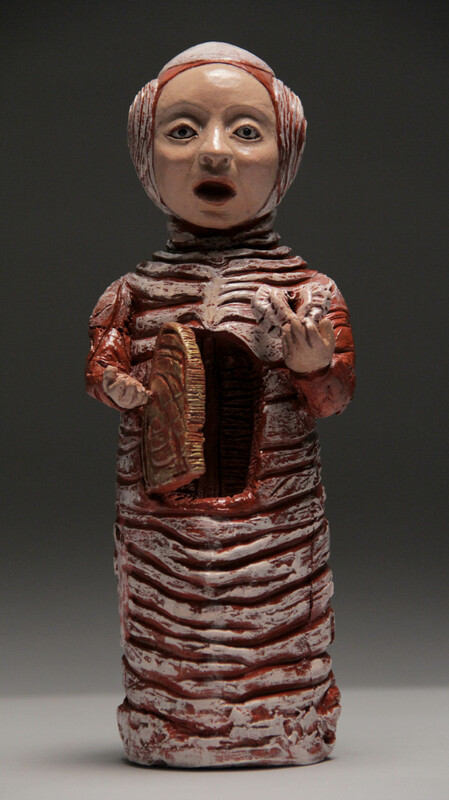 H 16 3/4" W 12 1/4" D 7 1/2 "
Tabernacle of the Untenable Bone, Clay, underglaze, glaze. 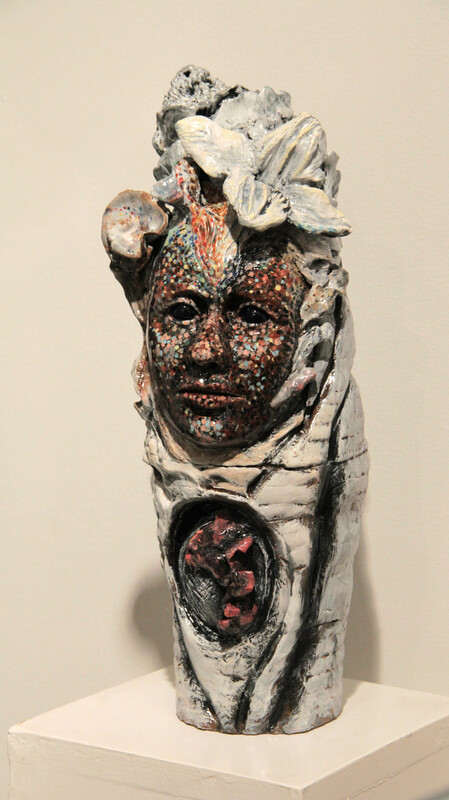 H 23" W 10" D 11 "
The Fruits of Speech reflected, clay, underglaze, glaze H 15 1/2" W 12 3/4" D 5 1/2 "
The Queen Paints all the Flowers her color, clay, glaze, wood, paint. 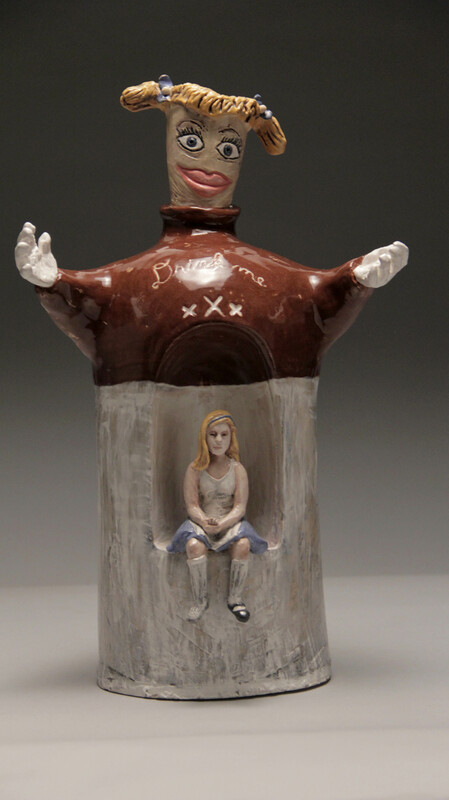 H 20 1/2" W 17 1/2" D 2 5/8 "
Tabernacle of the Invisible Girl, clay, underglaze, glaze. 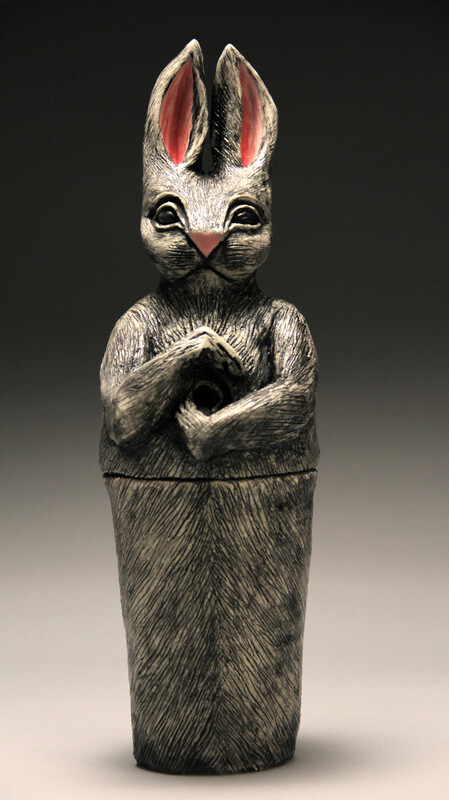 H 15 3/4" W 10" D 7 3/4 "
Votive Rabbit, clay, paint. H 36" W 14" D 16 "
The Wedding Party, clay, underglaze, glaze 12 figures, Collectively H 8 3/4" W 19" D 10 1/2 "
Inside Alice Darling, clay, underglaze, glaze H 16 1/2" W 6 1/2" D 5 "
Tabernacle of the Insatiable Beast, clay, underglaze, glaze H 13 3/4" W 7" D 7 1/4 "
In 2016 I started a series of rabbits inspired by the ancient Sumerian votive figures. 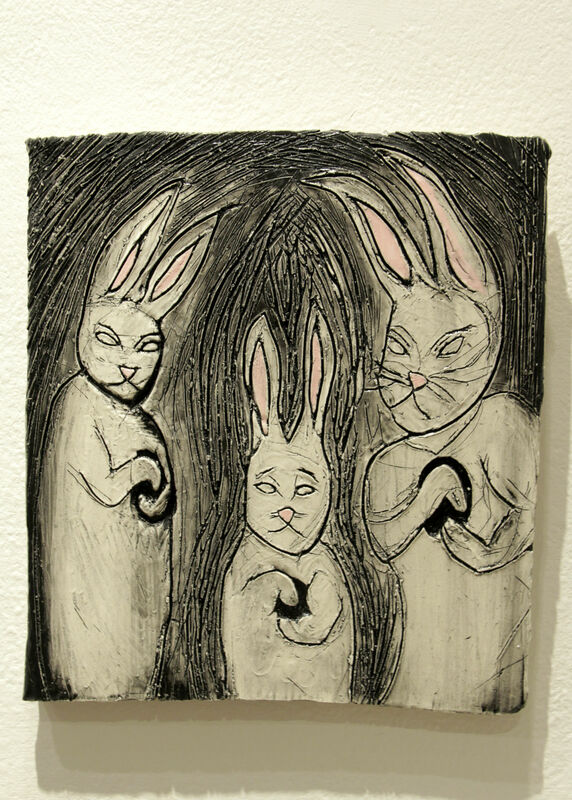 While these rabbits are somewhat naturalistic, I changed the position of the eyes to be more forward facing, more human. 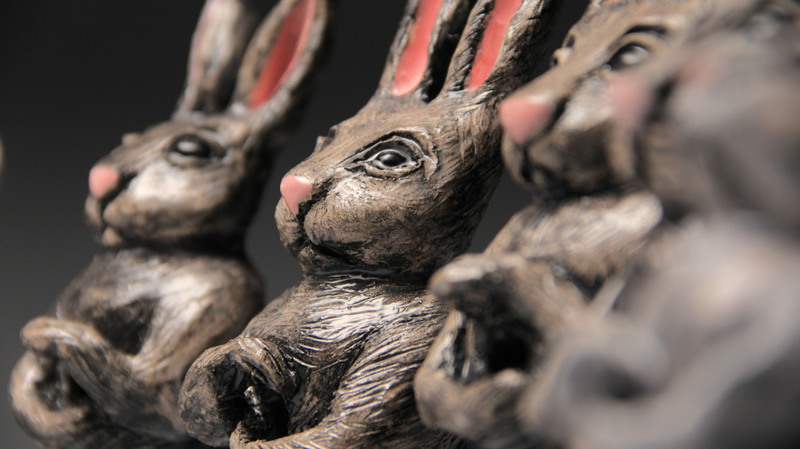 The rabbit's arms are encircling a hole in its chest, an inner sanctum. Its ears are at attention- with the left one cocked in a perpetual twitch-always listening. I made a series of these as incense burners, (The Wedding Party) jars, and large votive figures. 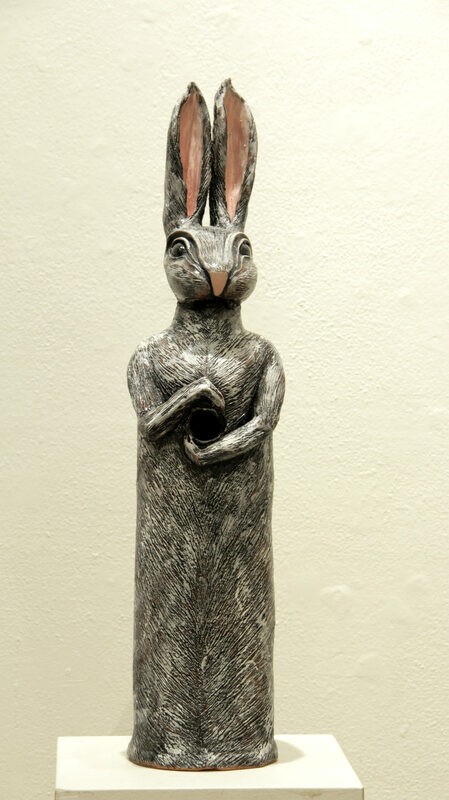 Large Votive Rabbit Clay 54 in. h. x 27 in. w. x 25 in. 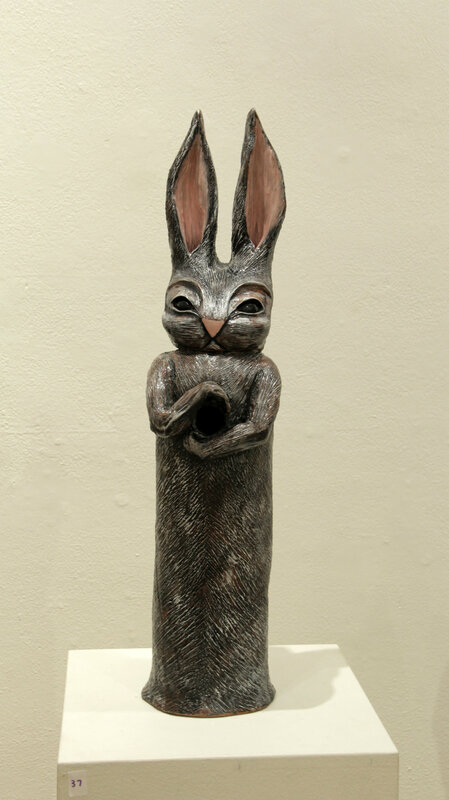 d.
Votive Rabbit Clay, glaze 17 in. h. x 6 in. w. x 6 in. 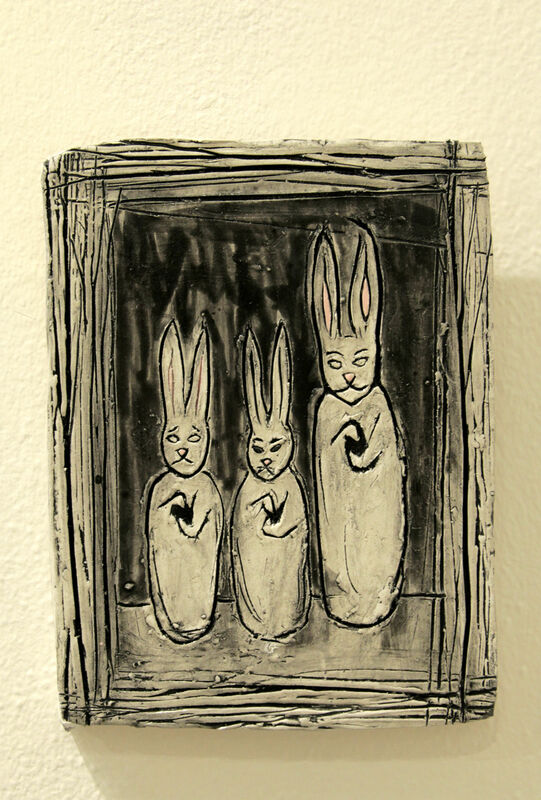 d. 2016 In 2016 I started a series of rabbits inspired by the ancient Sumerian votive figures. While these rabbits are somewhat naturalistic, I changed the position of the eyes to be more forward facing, more human. The rabbit's arms are encircling a hole in its chest, an inner sanctum. Its ears are at attention- with the left one cocked in a perpetual twitch-always listening. 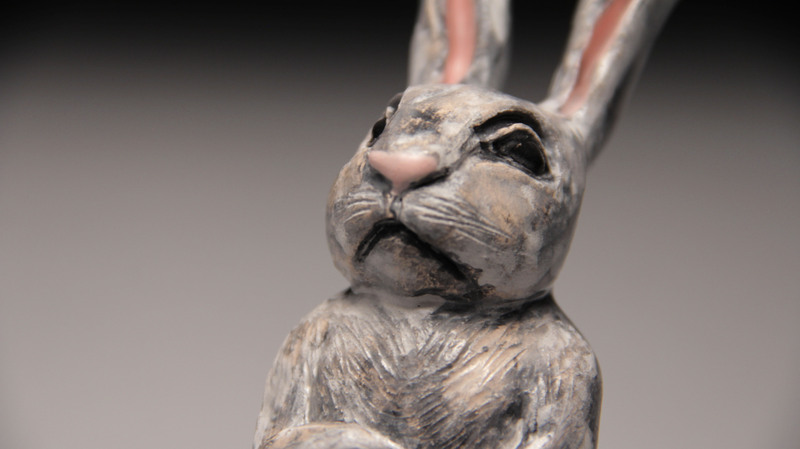 This particular rabbit is also a functioning jar. 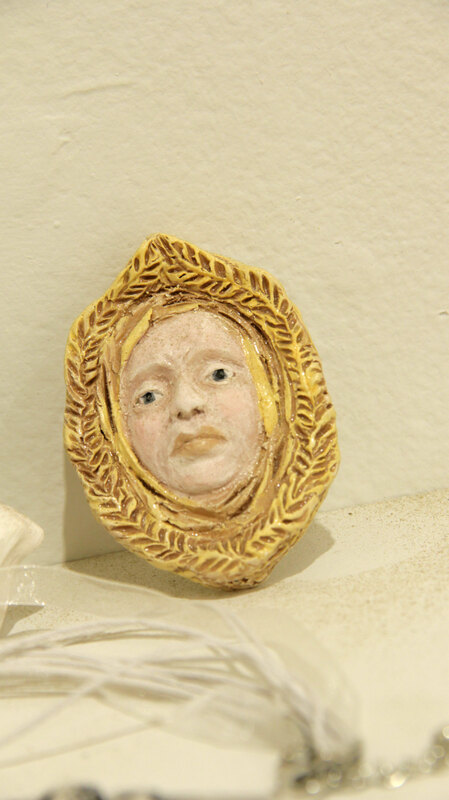 "The Wedding Party" CLay, glaze Variable sizes: smallest is 4.75 in. h. x 1.5 in. w. x 2.75 in. d., largest is 9 in. h. x 2.5 in. w. x 3 in. 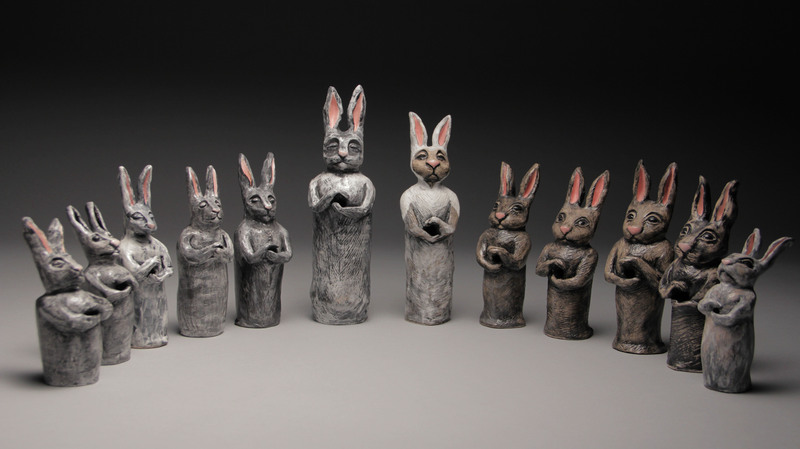 d This set of 12 votive rabbits are functioning incense burners. I was inspired to make these after viewing Sumerian votive figures at the Met. 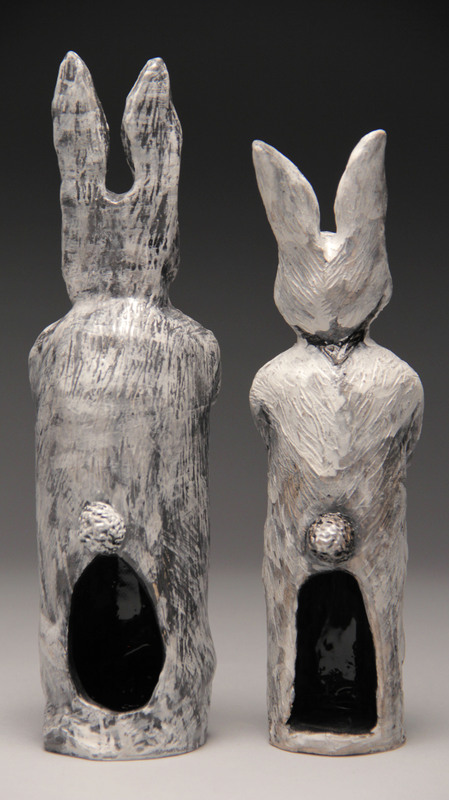 Smoke from the incense in these ritual figures streams out of the "rabbit hole" in the front. A cone of incese can be placed in the back of these functioning incense burners. 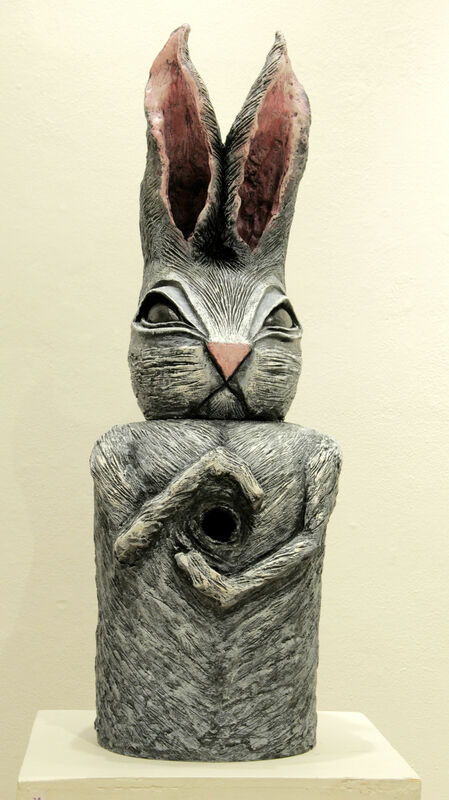 Smoke curls out of the "rabbit hole" in the front and surrounds the figure. 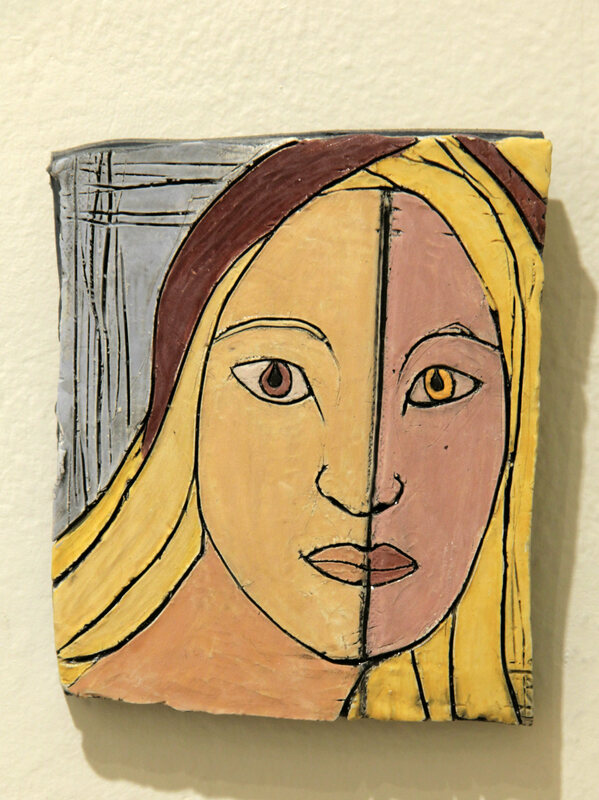 Clay, glaze 4.75 in. h. x 1.5 in. w. x 2.75 in. 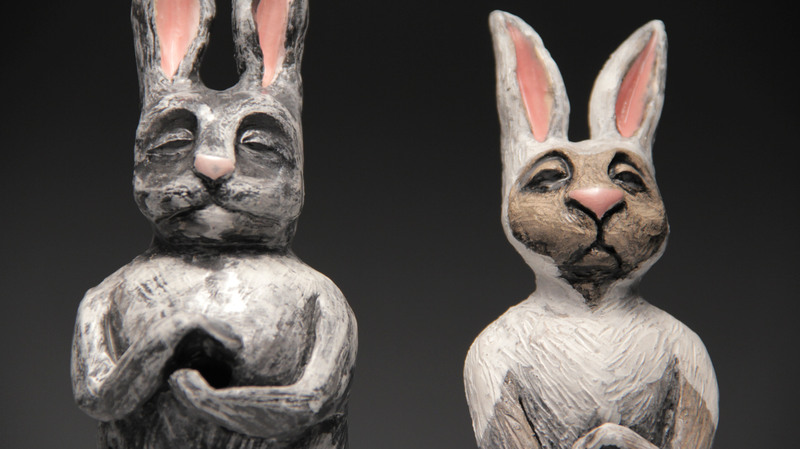 d.
Votive Rabbit, clay, underglaze, glaze H 23" W 5 3/4" D 7 1/2 "
Votive Rabbit, clay, underglaze, glaze H 23 1/2" W 6" D 8 "
Votive Rabbit Supreme, Clay, paint H 36" W 14" D 16 "
In the Catholic and Hebrew traditions, a tabernacle is a sacred dwelling place, usually a box or vessel, to house their deity, or a manifestation of that deity. 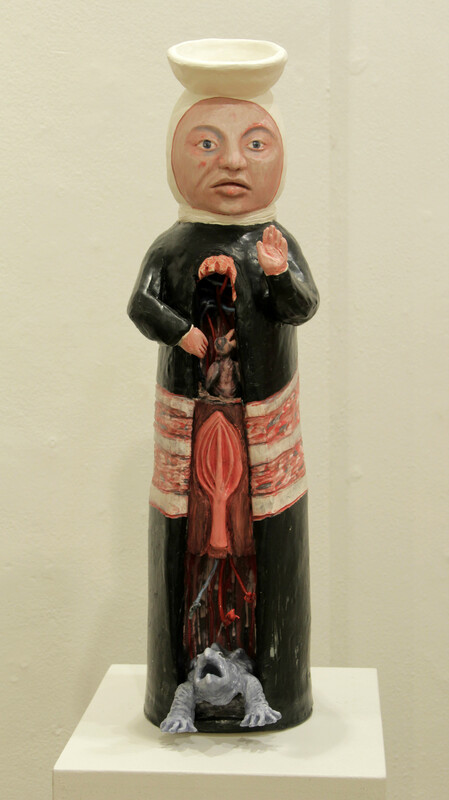 In the series of tabernacles I've made, I am using this form of religious vessel as a dwelling place for my own purposes-sometimes as a means to honor the ideas and individuals I am portraying, and at other times to subvert the traditional use of the tabernacle itself. 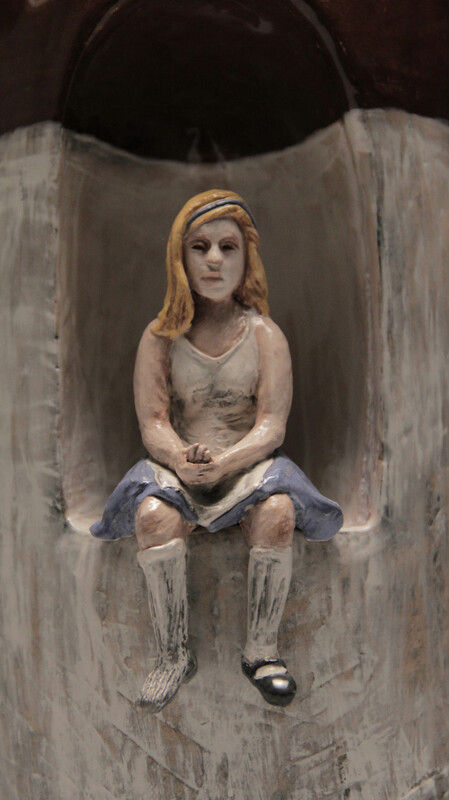 Tabernacle of the Invisible Girl Clay, glaze 16 in. h. x 9.5 in. w. x 6.5 in. d. I made this tabernacle in the form of a moonshine jug, with the traditional white and brown glaze- (there is a handle in the back.) Written in cursive on the front is "Drink me." 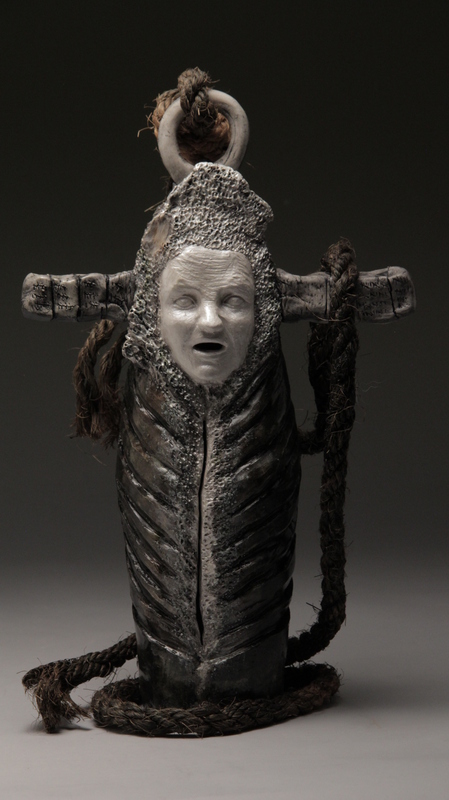 The cork for the jug becomes the head for the surrounding figure. This outer shell is what the"invisible girl" shows to the world. This public figure's arms are outstretched, her very body a vessel to be imbibed. She invites us to drink her in. Traditionally, there is a door to an inner sanctum in the middle of a tabernacle. Here, in this moonshine jug/tabernacle, where the inner sanctum would be is an alcove where "the invisible girl" is kept. With her fair hair, white apron and pale blue skirt and headband, she somewhat resembles the Disney version of Alice in Wonderland; but she is disheveled, missing a shoe, and her clothes are stained. She is perhaps more like what a real life Alice might look like after falling through a hole, and trying to perform an impossible task. 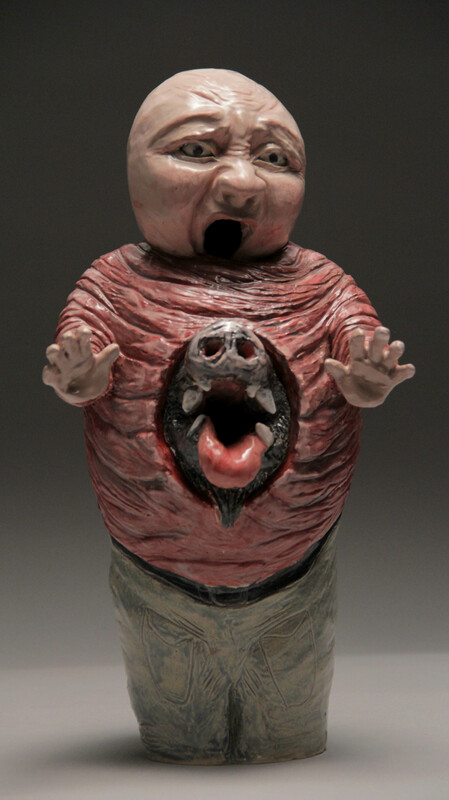 Tabernacle of the Insatiable Beast Clay, glaze 13.75 in. h. x 6.75 in. w. x 6 in. d The figure in "Tabernacle of the Insatiable Beast" gasps for air, and throws his hands out in a gesture that says "No more!" He is being slowlly smothered by his own corpulent body, while the beast who lives within demands more. I made the figure's torso to resemble red meat. This figure, at least in concept, is a partner to "Tabernacle of a Thousand Wants." Both are vessels to contain the "never enough." 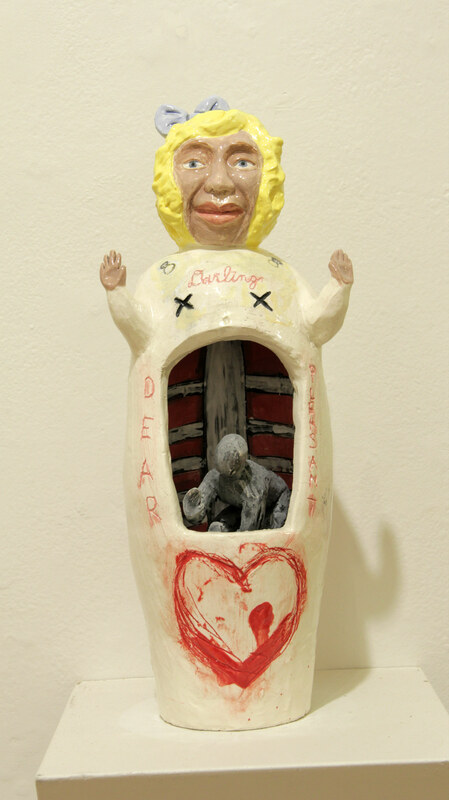 Tabernacle of the Calcified Heart Clay, paint 11 in. h. x 4.5 in. w. 5 in. 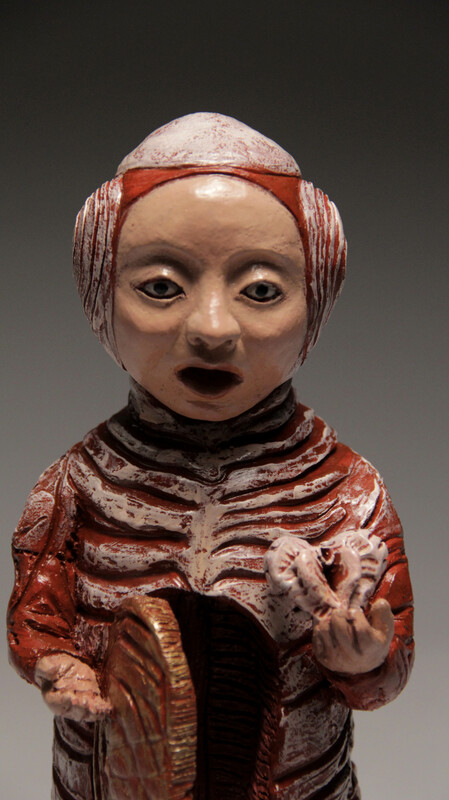 d. The figure in "Tabernacle of the Calcified Heart" is slowly being trapped within her own bones. Her skeleton rests over her like a suit of armor, or a cage. Mounds of bone have grown over her ears. 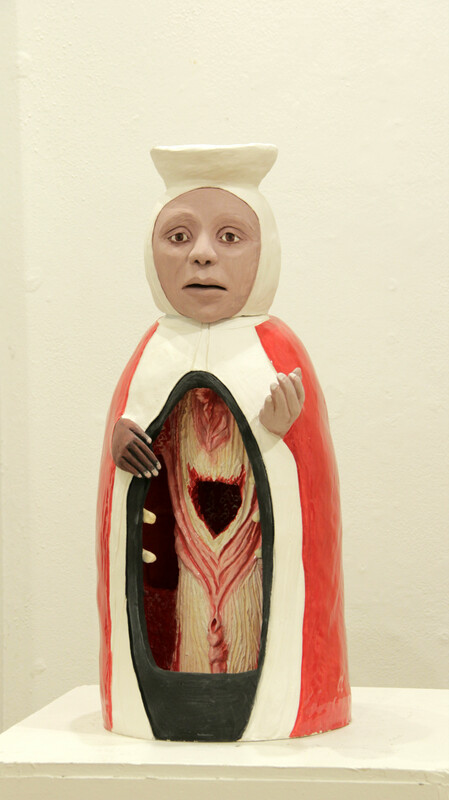 She has opened the door to her inner sanctum and is horrified to find that her own heart has begun to calcify. She holds it in her hand and wonders "How did this happen?" 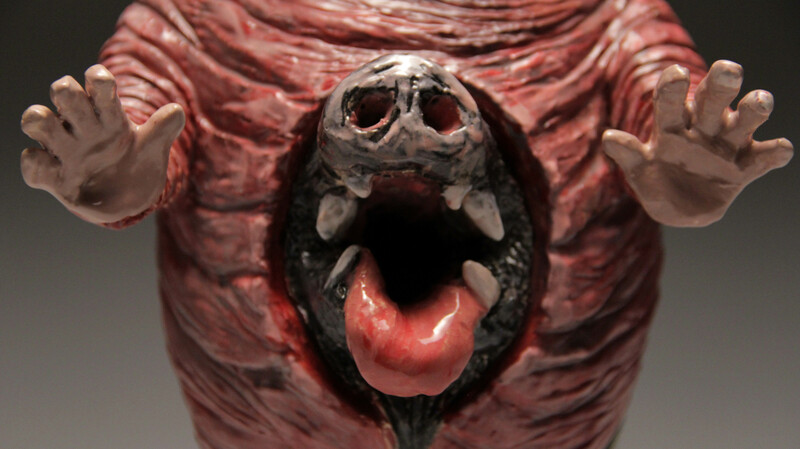 Tabernacle of the Calcified Heart, detail Clay, paint 11 in. h. x 4.5 in. w. 5 in. d. The figure in "Tabernacle of the Calcified Heart" is slowly being trapped within her own bones. Her skeleton rests over her like a suit of armor, or a cage. Mounds of bone have grown over her ears. She has opened the door to her inner sanctum and is horrified to find that her own heart has begun to calcify. She holds it in her hand and wonders "How did this happen?" Clay, gesso, oil paint. 16" x 4.75" x 6" "Storm Tabernacle" was inspired by my experiences during Hurricane Katrina. In designing the piece, I looked at Hokusai's print "The Great Wave off Kanagawa." "Storm Tabernacle" depicts two hands grasping in the center of the piece, surrounded by a hurricane symbol, waves and a distressed figure. Clay, oil paint 17 in h x 6 in w x 6 in d I made this tabernacle to honor the continual transformations that life demands of us. We are in a constant cycle of growing, dying and becoming anew - on multiple levels simultaneously. The strength for this must come from within. I imagined a dappled figure- whose colors sprouted like seeds, blossomed, died, and returned to their primordial state. 13 in. h. x. 4.75 in. w. x 3.75 in. 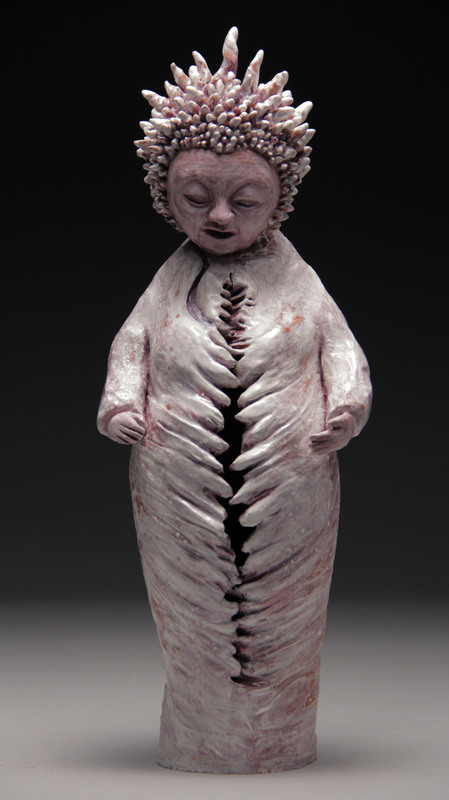 d. Clay, glaze I made "Tabernacle of the Unknowable Womb" in response to the mystery of new life and transformation- in all its incarnations. This sculpture was based off of a cowrie shell- which was regarded as a fertility symbol in ancient societies throughout Africa. 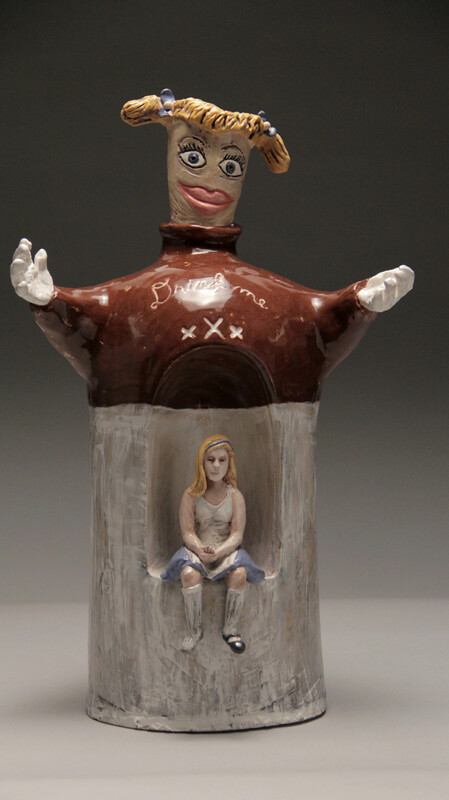 Family Portrait - clay, underglaze, glaze H 10 3/8" W 9 1/4" D 1 "
Discovering the Deepest Mirror - Sleep. 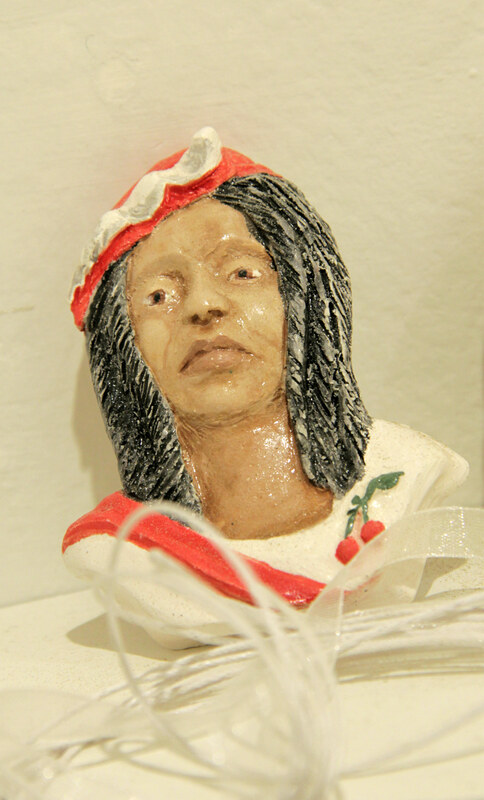 Clay, glaze, underglaze. 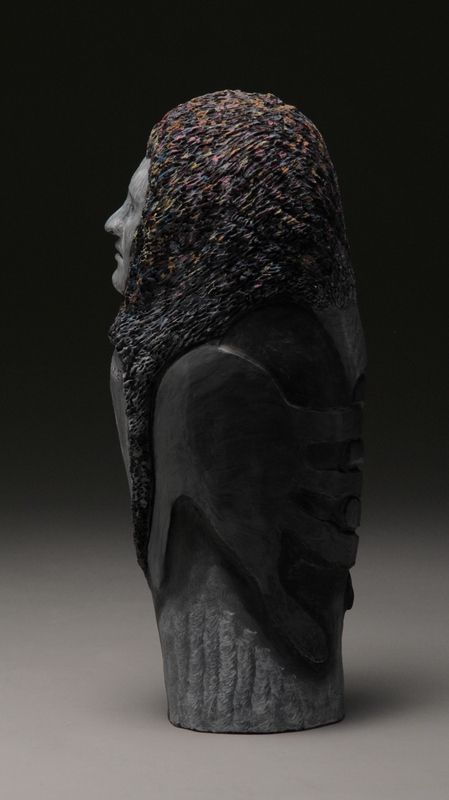 This piece is one of three "sisters" presented together at the 2018 solo show. H 14 1/2" W 9" D 2 1/4 "
Discovering the Deepest Mirror - Awakening. 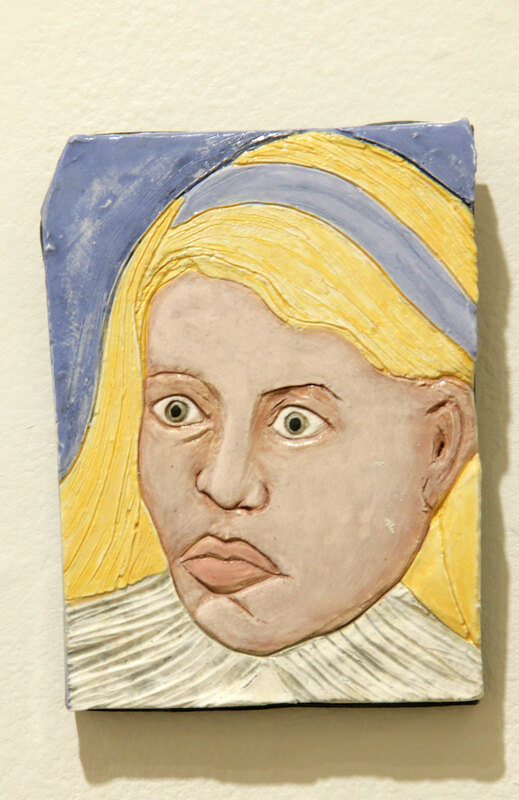 Clay, underglaze, glaze. 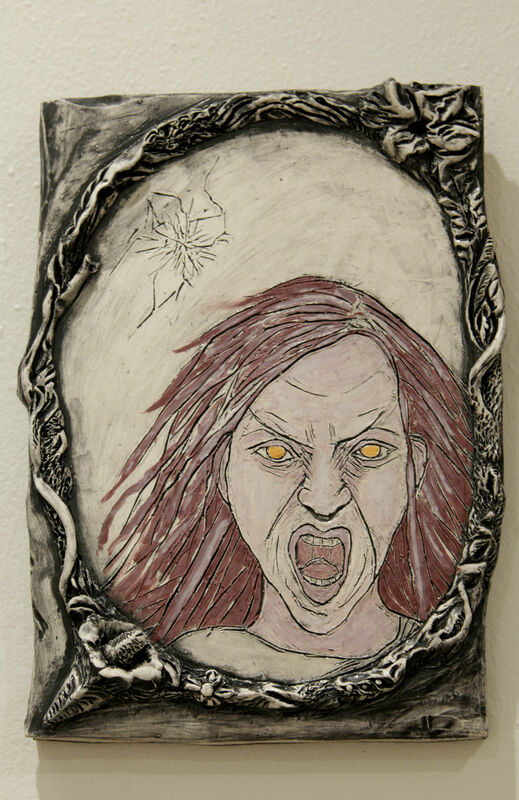 This piece is one of three "sisters" presented together at the 2018 solol show. H 15 1/4" W 10" D 2 "
Discovering the Deepest Mirror - Awareness. Clay, underglaze, glaze. 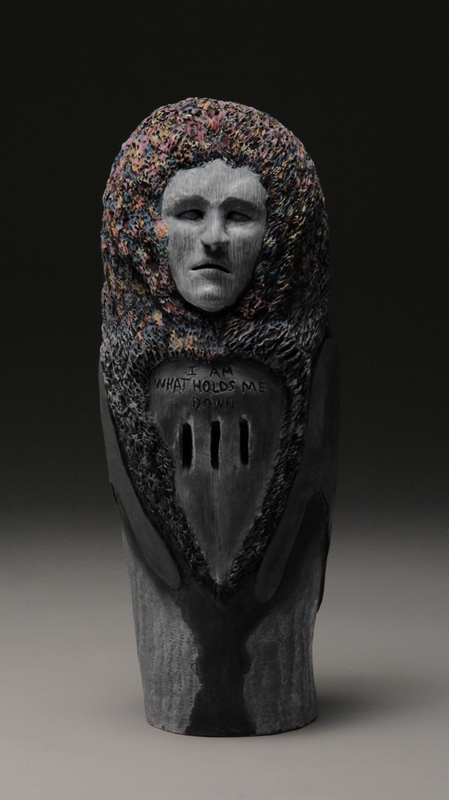 This piece is one of three "sisters" presented together at the 2018 solo show. 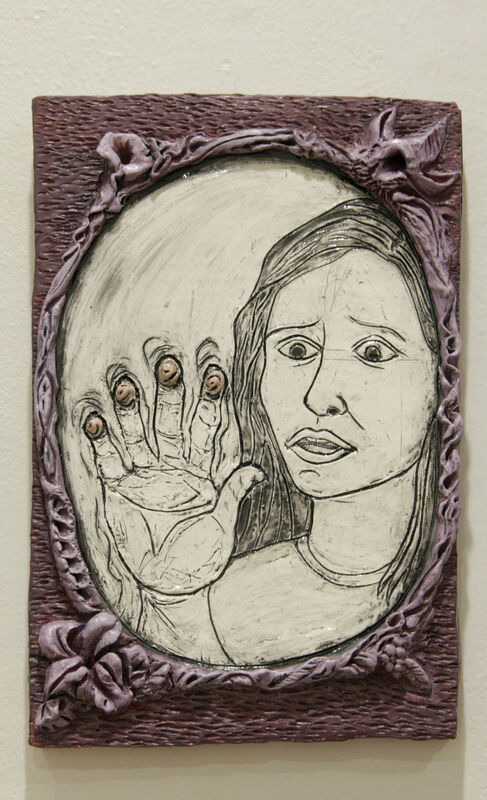 H 15" W 11" D 2 "
Alice in the Fractured Mirror- Clay, underglaze, glaze. 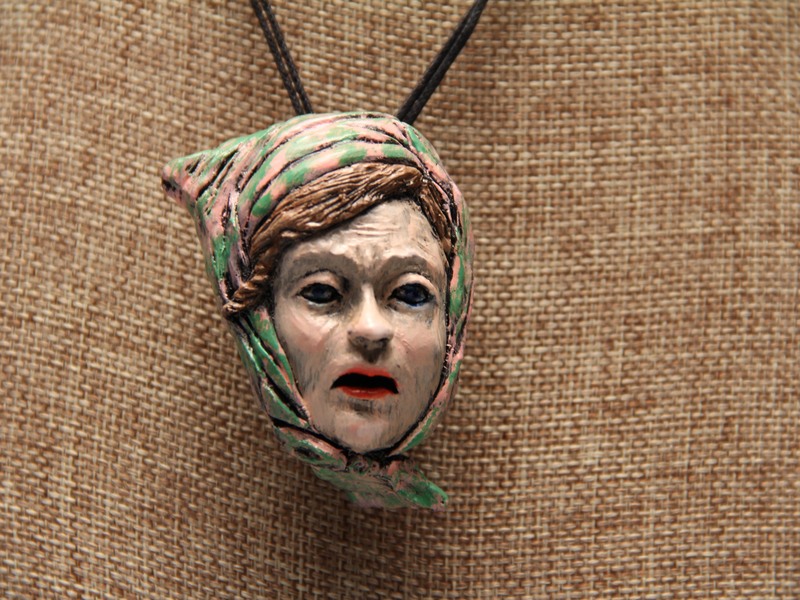 H 5" W 4 1/2" D 1 "
Frightened Alice in a Flemish Collar, clay, underglaze, glaze. 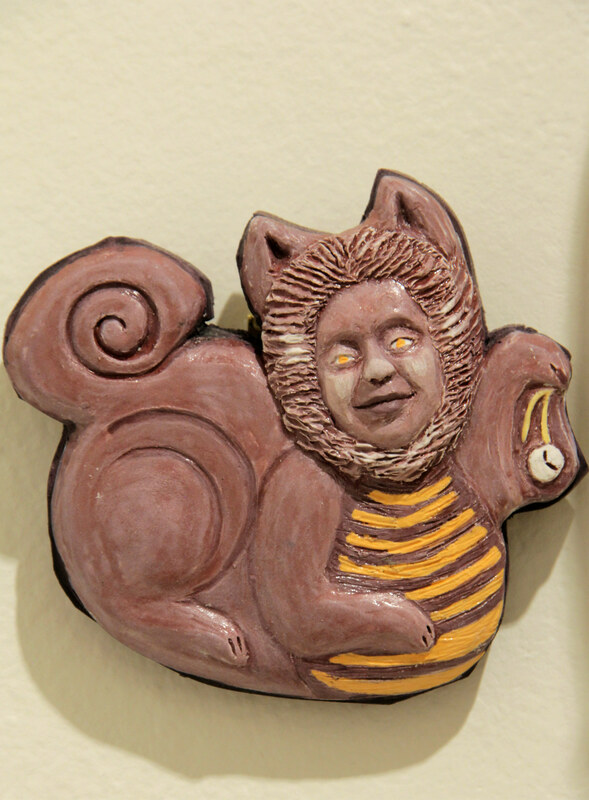 H 6 1/4" W 4 3/4" D 1 "
Alice as Cheshire Cat, clay, underglaze, glaze. 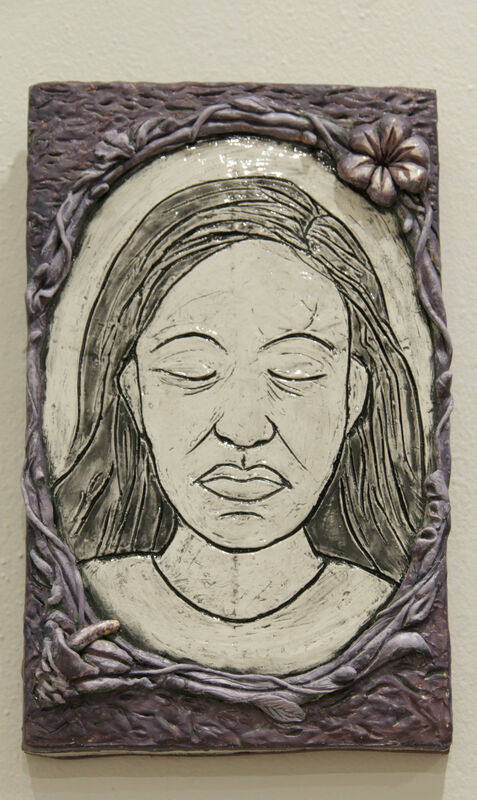 H 6" W 5" D 1 "
Obey the Sign of the Queen, clay, underglaze, glaze H 16 1/4" W 12" D 1 3/4 "
Family Portrait - Single Mother Clay, underglaze, glaze. 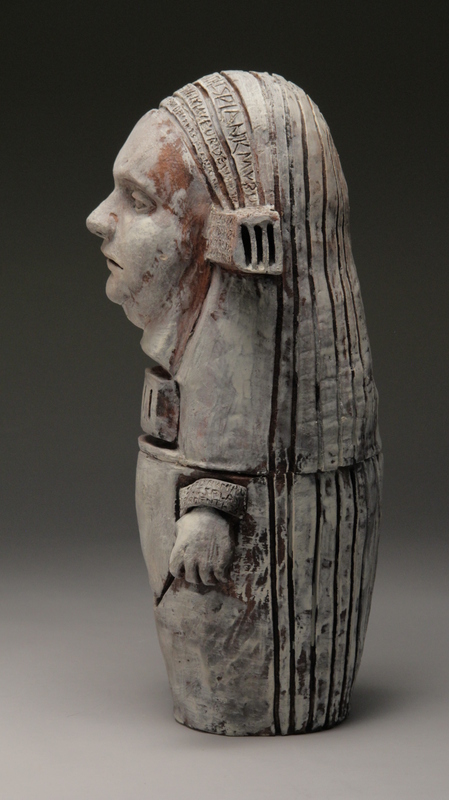 H 11 1/2" W 8 5/8" D 1 "
The form of these sculptures is inspired by a Canaanite burial pod I viewed at the University of Pennsylvania Museum. I was struck by the Canaanites use of clay to encase the remains of a loved one- its form resembled that of a seed to be replanted into the earth. On the front of the pod was a face enraptured, with two arms and hands coming around from the sides in what looked like a lover's embrace. 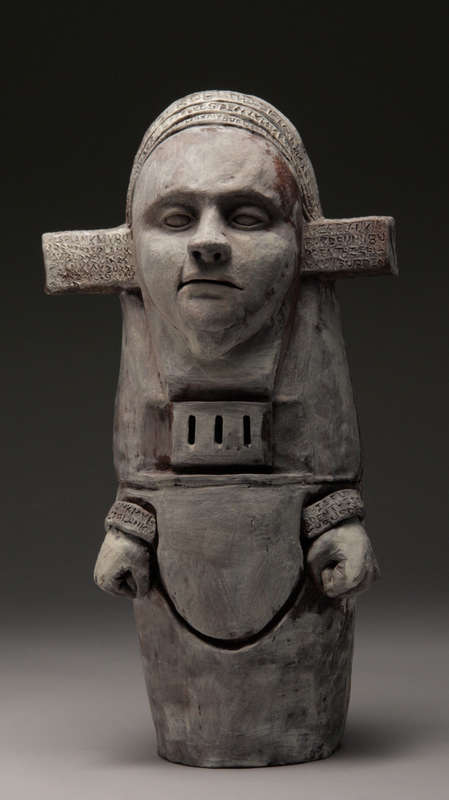 Many cultures have used clay to honor the body, as seen in Egyptian canopic jars, Mayan ritual vessels, and Chinese funerary sculpture, among many others. 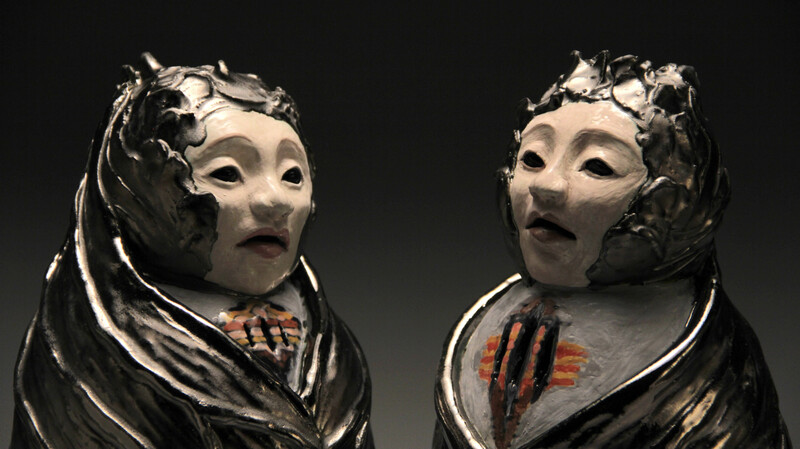 In my work, I've used clay and traditional forms as a structure to present my experiences as a human in 2015. Technically, there is a logic and beauty in creating these ancient forms, but I think I enjoy just as much the sense of connection to our shared humanity and the past. I also certainly feel free to adapt the forms for my own purposes. These pieces have become my way of participating in a larger world. 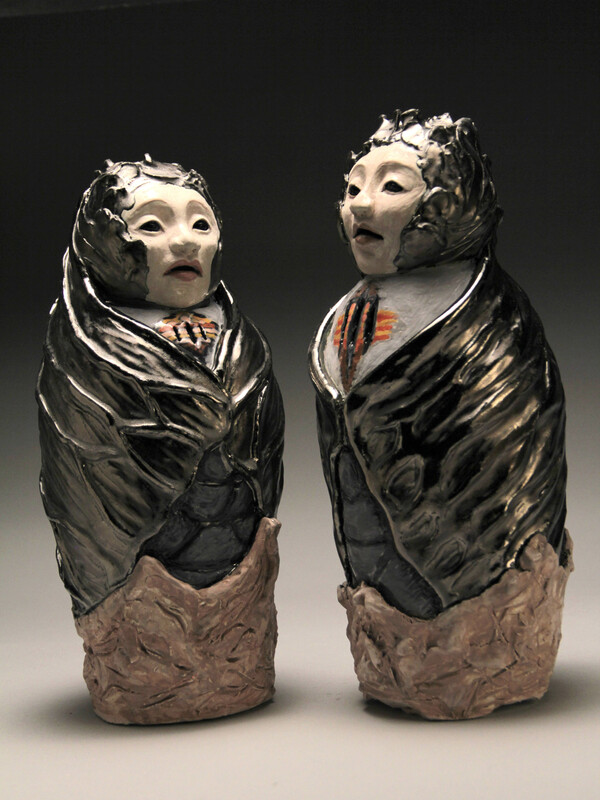 "First Breath" Cicada Vessels Clay, glaze 15 in. h. x6.5 in. w. x 7 in. d. 2016 I based this pair off of cicadas when they are just emerging from their old exoskeleton/ shells. How fresh the air must seem- thought it fitting fot the New Year. I made these for my father and his youngest sister- who are indeed a pair. 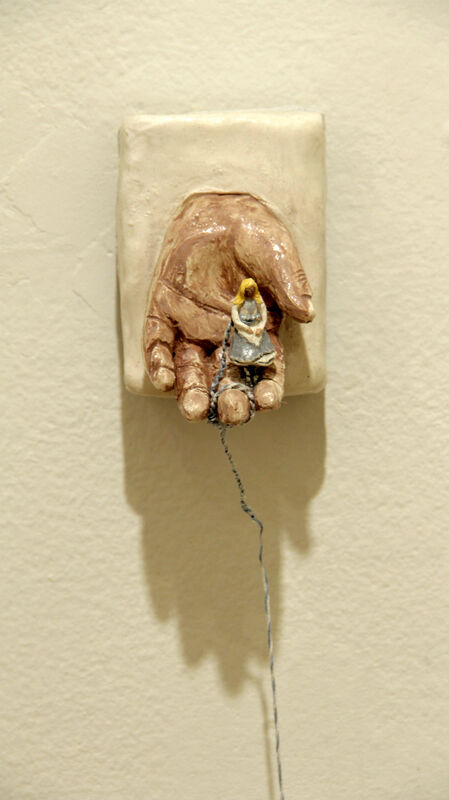 Clay, gesso, oil paint 14.5" x 6,5" x 5" "This Plank My Burden" is a figurative vessel inspired by my Catholic upbringing. The phrase "This Plank My Burden" is incised into the clay around the figure's head, as well as on the cuffs around the hands. At heart level is a jailer's grate for ventilation. 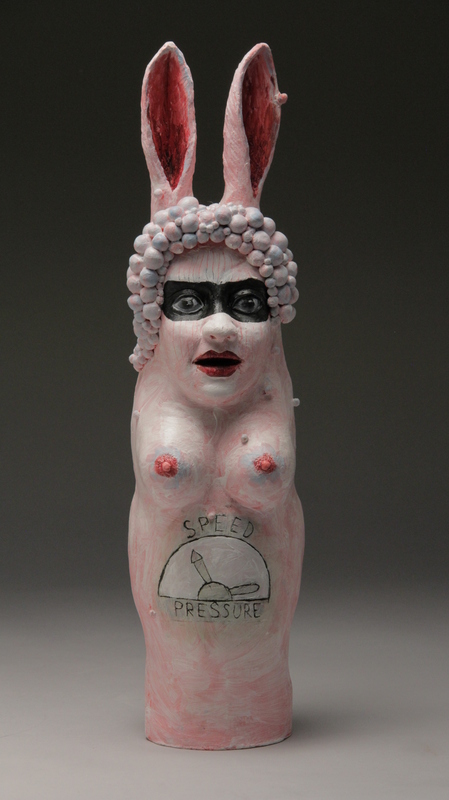 Clay, gesso, oil paint 15" x 3.75" x 4" "Time is Not Enough" was inspired by relatives demanding fresh children. The figure wears a bandit's mask, and is constantly made aware of her situation through the gauge on her belly that monitors "Speed" and "Pressure." Ova surround her like bees. A pair of rabbit's ears keep her attentive. 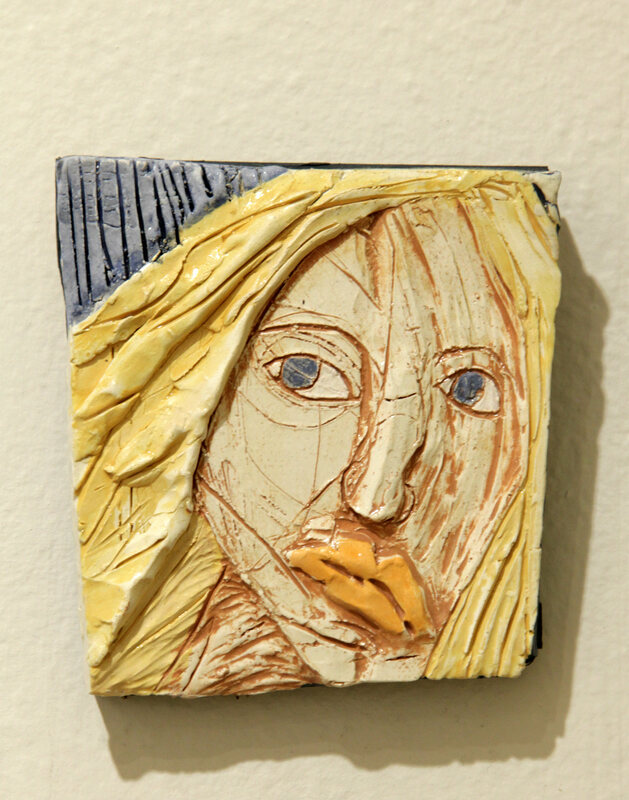 Clay, gesso, oil paint 10.5" h. x 3.5"w x 4"d. "I am What Holds Me Down" is the clay embodiment of the realization I have in the face of all my foibles. Owl-like, the figure seems perched for flight- but where there should be wings are a pair of gray hands draining the color out of its feathers and holding it down. Clay, gesso, oil paint, rope 14.5" x 7.5" x 3.5" "Premature Cull" is a figurative vessel inspired by stories of local oyster fishers. The vessel mimics the form of the Canaanite burial pods I've modeled my sculptures after for years, but also resembles the color and texture of the oyster itself. The expression is of one who is pulled too soon. 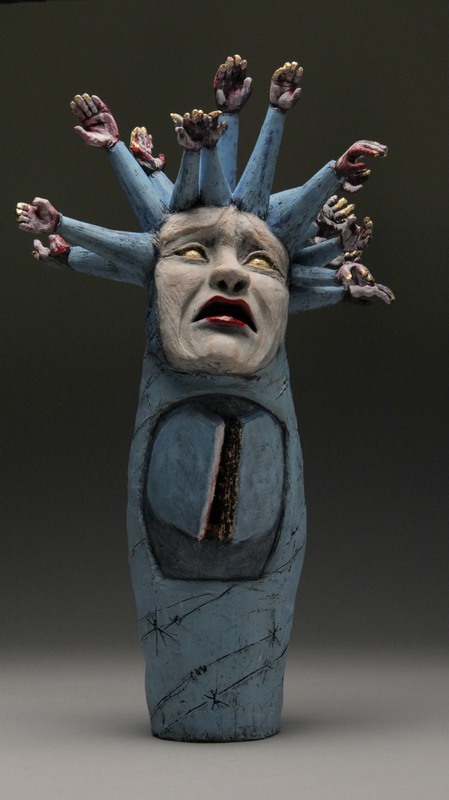 Self Totem, female - clay, glaze, underglaze. 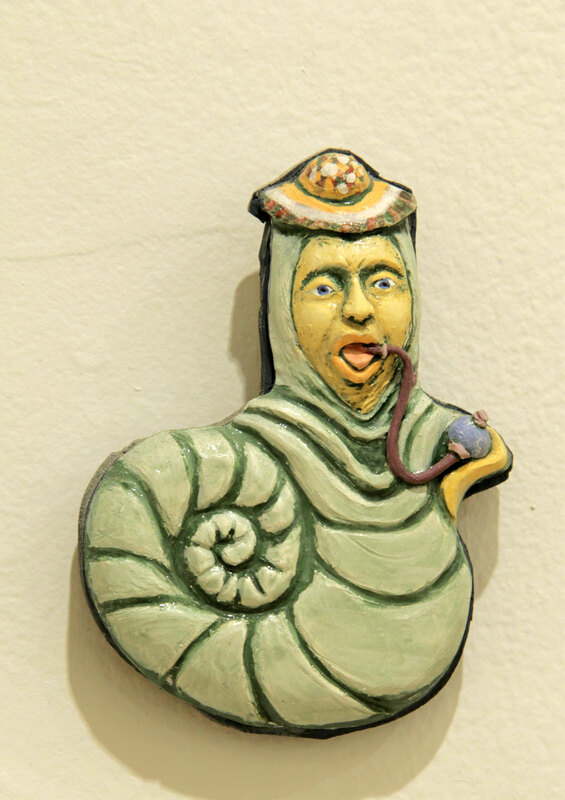 H 22 1/2" W 6" D 8 1/2 "
Self Totem, male - clay, glaze, underglaze. 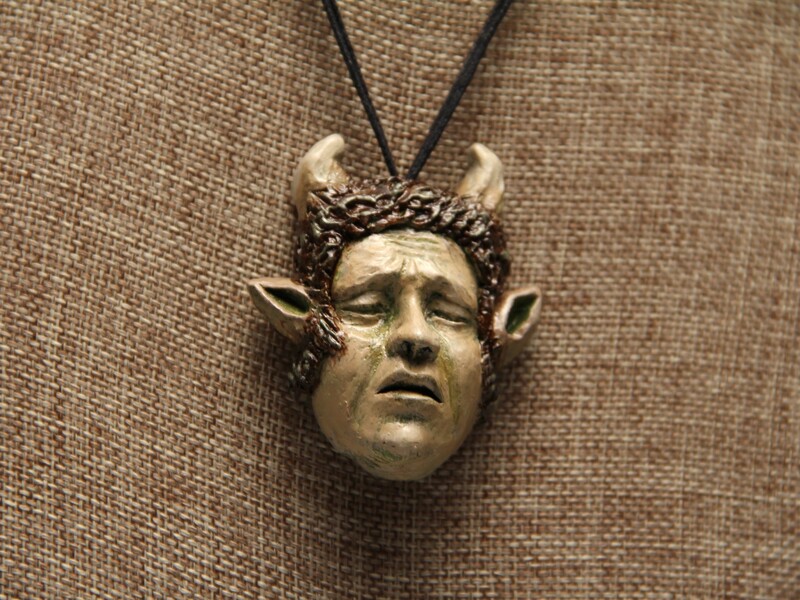 H 22 1/2" W 6 1/2" D 8 "
The title of this small pendant sculpture is "Pan cries at the spoiling of the earth." I am often inspired by Greek mythology, and I imagined poor Pan today seeing the destruction of the environment. Pan is 2.25 inches tall, 1.9 inches wide, and 0.9 inches deep. I sculpted the figure out of clay, fired it, then finished it with acrylic paints in various shades of brown, white and green. He has two small white horns emerging from his brown curls, and green and tawny faun ears. The pendant hangs from two strands of black waxed cotton cord (approximately 17 inches). 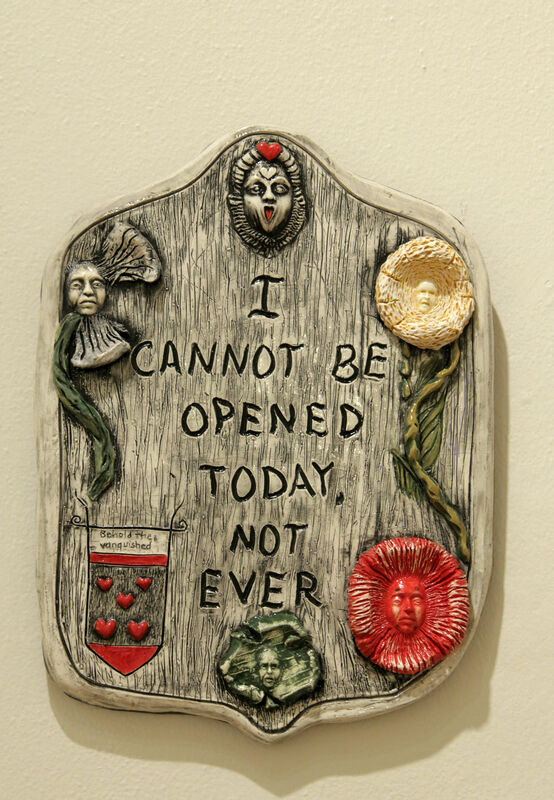 Getting Out of Hand, Clay, underglaze, glaze, thread. 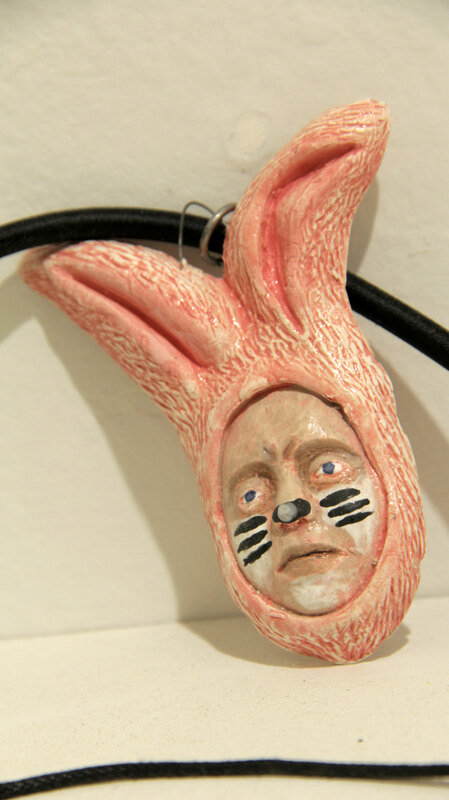 H 4" W 2 3/4" D 2 3/4 "
Cheshire Cat, clay, underglaze, glaze H 4 3/4" W 5 1/4" D 1 1/2 "
Smoking Caterpillar, clay, underglaze, glaze H 5 1/4" W 4 1/4" D 1 1/2 "
Figure in Pink Bunny Costume Necklace, clay, underglaze, glaze, cord.